Stunning early 18th century birds-eye view of Malta. 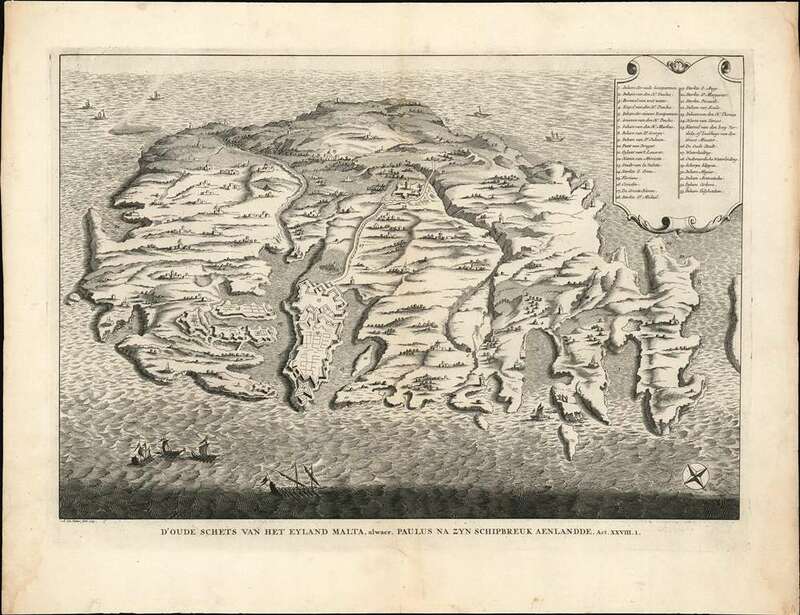 D'Oude Schets Van Het Eyland Malta, alwaer, Paulus Na Zyn Schipbreuk Aenlandde . Act. XXVII.1. A scarce and visually stunning Augustin Calmet 1729 topographical map and view of Malta. The map, which is oriented with north in the lower right corner, illustrates the island in full from a birds-eye perspective, with mountains, buildings, trees, and fortifications rendered in profile. This map was originally prepared for a Dutch Bible to illustrate the shipwreck of St. Paul (Acts 27.27-.32). Legends suggest that around the year 60 AD Paul's ship, which was transporting him from Caesarea to Rome, wrecked in St. Paul Bay on the eastern side of the Island. Saint Paul stayed in Malta for about three months where he performed a number of miracles, including the healing of the father of Publius, Malta's Roman governor. Whether or not this has any truth, the Malta depicted here represents a more contemporary perspective. The fortifications of Valletta are clearly visible as are various small towns, fortifications, and lookout towers. A key in the upper right quadrant corresponds to numerical references found throughout the map. Drawn by Augustin Calmet and engraved by Abraham de Putter in Amsterdam for an unknown Dutch Bible. Antoine Augustin Calmet (February 26, 1672 - October 25, 1757) was a French Benedictine monk and Biblical scholar active in the late 17th and early 18th century. Calmut was born at Ménil-la-Horgne in Lorraine. He joined the Abbey of St-Mansuy at Toul in 1688. Approximately ten years later he was assigned to teach philosophy and theology in Moyenmoutier Abby. There he gathered the various materials and commentary with which he would eventually compose his important theological studies. Calmet's work initiated a new era of Biblical exegesis in which the dominant allegorical approach to theological analysis was replaced with a critical search for meaning and significance. Calmet was a religious as well as a learned man, and one of the most distinguished members of the Congregation of St. Vanne. In recognition of these qualities he was elected prior of Lay-Saint-Christophe in 1715, abbot of St-Léopold at Nancy in 1718, and of Senones Abbey in 1729; he was also twice entrusted with the office of president or superior general of the congregation. Pope Benedict XIII wished to confer Episcopal Dignity upon him, but in his humility could not be brought to accept the honor. Among Calmet's more interesting works is a 1746 treatise that ambiguously, though not explicitly, considers the existence of Vampires. Calmet died at Senones Abbey, near Saint-Dié, on 25 October 1757. A. Abraham De Putter (fl. c. 1700 - 1740) was a Dutch artist as well as a map and architectural engraver active in Amsterdam during the first half of the 18th century. De Putter is better known for his architectural engravings and paintings than his maps, which are few. Very good condition. Minor foxing to margins, left side. Original centerfold. Platemark visible. Blank on verso.